Abstract Three key ways of updating one's knowledge are (i) perception of states of affairs, e.g., seeing with one's own eyes that something is the case, (ii) recep- tion of messages, e.g., being told that something is the case, and (iii) drawing new conclusions from known facts. If one represents knowledge by means of Kripke models, the implicit assumption is that drawing conclusions is immediate. This as- sumption of logical omniscience is a useful abstraction. It leaves the distinction between (i) and (ii) to be accounted for. 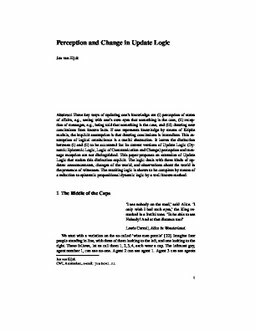 In current versions of Update Logic (Dy- namic Epistemic Logic, Logic of Communication and Change) perception and mes- sage reception are not distinguished. This paper proposes an extension of Update Logic that makes this distinction explicit. The logic deals with three kinds of up- dates: announcements, changes of the world, and observations about the world in the presence of witnesses. The resulting logic is shown to be complete by means of a reduction to epistemic propositional dynamic logic by a well known method. van Eijck, D.J.N. (2011). Perception and Change in Update Logic. In D.J.N van Eijck & R Verbrugge (Eds. ), Games, Actions and Social Software. Springer.